Dow New High, Another Stocks Bear Market Goes Up in Smoke, Forget QE Tapering Expect Expansion! The Dow Jones stocks index closed at another all time high of 15,676, catching many if not most so called market analysts off guard as for the duration of the stock markets latest correction could be found to be singing the new secular or cyclical bear market has begun mantra, despite the fact that many of whom have been singing the same tune for the duration of the 5 year plus of the stocks bull market. The latest excuse for being wrong once more is that Ben Bernanke apparently surprised all with his announcement for the continuation of money printing (QE) at the rate of $85 billion per month, though readers of my articles will know and understand that MONEY PRINTING CANNOT END whilst large budget deficits persist AND below trend growth continues. A reason can always be found to explain WHY the academics and perma-bear crowd got it wrong again, however what many clearly fail to comprehend is what the consequences of rampant money printing is, be it called QE, debt or go by a myriad of other names, the consequences IS ALWAYS EXPONENTIAL INFLATION. That is the mega-trend that the worlds economies remain immersed in. To reiterate what I have stated literally dozens of times over the duration of the stocks stealth bull market that began in March 2009 (Stealth Bull Market Follows Stocks Bear Market Bottom at Dow 6,470 ), that there is no cyclical or secular ONLY BULL or BEAR, only LONG or SHORT, either that or as is more probably the case those that are most vocal commentators NEVER actually TRADE or INVEST with their OWN money! That is self evident in the fact that had they traded with their own money, then by now they would have gone bust several times over! My ebook of Feb 2013 (Stocks Stealth Bull Market Ebook for 2013 and Beyond ) reiterated at length what I consider to be the real secrets for successful trading which you can download for FREE! For the primary mechanism for being to be on the right side of the market is to be conditioned by the market through the mechanism of profit vs losses. If you don't trade or invest then you will never have a clue, which is why journalists, economists and the TA sales industry cannot even get things right by looking in the rear view mirror to explain what has already happened let alone what probabilities imply is likely to happen going forward! Know this that the media can always find a reason in hindsight but the same reason can and usually IS used to explain either rally's or drops, which illustrates just how clueless the mainstream financial press tends to be! In terms of the stock market, whilst my focus for the past year has been on the emerging housing bull markets, however, I am still targeting to have 20% of my wealth invested in stocks by the end of this year (current 20%). The following graphic illustrates the money printing exponential inflation cycle for the UK which also holds true for many other nations. 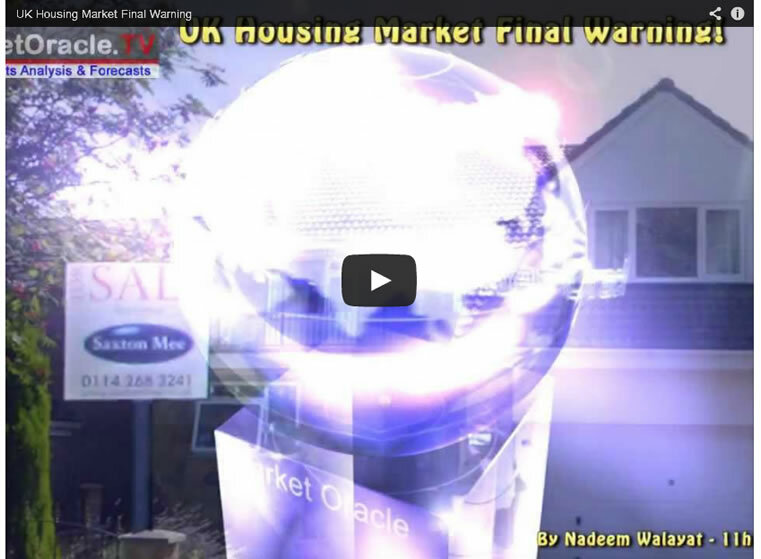 My focus for over a year has been increasingly on the emerging US and UK housing bull markets, as I have increasingly flagged the much hated housing asset classes to focus upon for the UK and US as presenting a once in a decade opportunity as the embryonic bull markets of 2012 HAVE morphed into the new bull markets of 2013, where I expect UK house prices to be rising at a rate of 10% per annum for October 2013 data and by 12% per annum by Jan 2014 (Halifax NSA) (19 Aug 2013 - UK House Prices Bull Market Soaring Momentum, 10% Inflation by October? )and longer term I expect the bull market to run for virtually the whole of the remainder of this decade, ensure you are subscribed to my always free newsletter to get my ongoing in-depth analysis in your email in box. As a guide of what one could consider doing to protect themselves from the ongoing money printing fraud, the following updated table illustrates how my portfolio is trending in terms of asset classes to protect both against inflation stealth theft and possible outright theft of bank deposits cyprus style. The bottom line is this - QE is a PANIC Measure, which means the worlds central banks remain in PANIC MODE! As I pointed out near 4 years ago in the Inflation Mega-trend ebook (FREE DOWNLOAD), they ONLY have one answer which is to PRINT MONEY! There is NO other answer! the consequences of which is INFLATION. SO, leverage yourselves to Inflation by investing in assets that CANNOT be printed - SIMPLE! All politicians and central bankers are infected by the highly contagious money printing virus! Forget Tapering, instead expect the next Fed Chairperson to EXPAND QE to MORE than $85 billion per month! - Remember you heard it here first! Hi Nadeem, I am very confused about your view that global inflation will rise following relentless extensions of QE. Robert Prechter has correctly predicted, since 2008, a Major Deflation scenario, with the recent run-up in the 10-year Treasury Note spiking at 3 % before resuming the clear downtrend. Prechter believes we are in a multi-year deflationary downtrend. Massive global Capex increases since 1980, Globalization with $1/hour wages, 'real' U.S. Unemployment of 23 % (if we calculate U1-U9 and ignore the ludicrous Birth-Death rate adjustment), huge increases in global Wealth Gaps that reduce worker bargaining power, and many other factors, suggest Prechter is correct. Obviously there are pockets of inflation in various sectors (U.K. house prices, for example, and occasional commodity spikes), but since Western governments are between a rock and a hard place they will keep interest rates low if they continue QE, and they will trigger a crash and a recession if they stop it. In either case interest rates will remain low! My point is that the best investment, in either scenario, is in high grade, high dividend stocks with massive free cash flow and earnings that are at least double the dividend payout. I see this as a no-brainer. Am I correct. 29 Sep 13, 08:10 Correct on what ? There has been NO deflation, pure delusion. There has been no debt deleveraging, another red herring, the derivatives soup is X times bigger! LOL for many years they were saying QE would be deflationary. So what did the deflationistas like above and Mike Shedlock get right ? specifically, show me a market, actionable entry and exit. 29 Sep 13, 09:18 "Deflation Delusion"
Since current 'inflation' is not intrinsic but caused by governmental Fiat, it will transform into 'deflation' once governments take their feet off the QE accelerator, since any official tightening will precipitate a crash. In this sense Prechter is spot-on. It's like if I lent you $ 1 million to buy a house, with no collateral, and you buy the house, take out a mortgage, buy a car and other consumer items ..... And imagine if millions of people did this, then the prices of houses, cars and everything else would rise. Now, if such lending suddenly stopped the temporary inflation bubble would be burst. Hence current inflation is artificial, while subsequent deflation will be fundamental and very severe. In theory we would have had and will have deflation, in reality we won't. IF... is a big word to use. The govrnments and central banks have already printed enough money and debt to DOUBLE house prices (conservative stimate). I have heard the deflation threat for 5 years! why you should not buy stocks,x,y,z cos deflation is IMMINENT. Deflation is an academic argument made by vested interests or clueless commentators (not directed at you) that clearly never put their own money down because they would have gone broke betting on a bear market. Research - Fractional reserve banking, the Quadrillion+ of Derivatieves, the expoenntial inflatiob mega-trend. Even Mike Shedlock after being WRONG for 5 years is eventually turning Inflationista,. But he too would have gone broke had he folowed his own advice. 29 Sep 13, 15:23 The Deflation Delusion??? I'm not one of those "commentators" who never put their own money down. In fact I've been investing millions of my own money successfully for 30 years. There are many factors that influence stock prices, this we all know, but to me the most important one is interest rates, in particular the 10-year TNote whose yield is swooning again. I bought more stocks in 2008 BECAUSE of the recession and low interest rates. I have held on till today and am looking for signs to lighten up but I don't see them as long as TNotes and TBills are at near historic lows. If QE ends these rates will go even lower because an initial spike will be followed by a rate-busting Great Depression (which will boost the value of my high dividend, blue chip utility and oil stocks as occurred in 1987). If there is inflation, or looming inflation, then why are TBill/Bond yields at historic lows, and what will it take to boost them? It would require genuine GDP growth, not CPI growth which will crash without GDP growth (most of which in any case is distorted in the form of inventory build-ups and other (negative-)positive GDP data). I simply do not see long lasting, demand-based inflation anywhere on the horizon. I edited my earlier comment, because I was not directing my general comments at you, sorry for that. U.S. Treasury yields, this is why I write indepth articles because one answer leads to another question, the answer is simple, the reason why yields are low is because the central banks are monetizing debt. My next indepth analysis WILL be on debt, then the one following that WILL be on inflation. 29 Sep 13, 18:16 Inflation or deflation?
" ..... the answer is simple, the reason why yields are low is because the central banks are monetizing debt." 1. Yes, but they're monetizing debt because there would be zero growth without it, and they are terrified of deflation. 2. If they stop monetizing debt they will trigger recessions. Therefore, low yields are a reflection of weak global economies. Current inflation is speculation-based, not demand-based, and will sink through over-supply. Take the U.S. as an example: Despite $ 4 trillion of QE, real wages have actually declined over the past 5 years. The consumer is dead in the world's largest economy. Where is the Demand going to come from? Any tightening will cause another global recession. Anyway, looking forward to reading both articles. You answered your own question. Central banks will NOT ALLOW DEFLATION to take place! There can be an infinite number of IF's but thats all they remain IFs, rather than what IS. But, whilst you answer your own question, you then revert back to saying low yields are because of ......., when they are because of Central banks monetizing debt! The key thing to do is to forget about what IF's and focus on what IS. That's what I do. Inflation is not what if, it is an exponential trend that compounds each year around which asset prices are leveraged to and osciliate to. Sept. 30th: Eurozone flash CPI has slipped to a 3 1/2 year low of +1.1% on year in September from +1.3% in August and come in below consensus of +1.2%. Food, alcohol and tobacco have experienced the highest rate of inflation, while energy prices have fallen. The CPI reading is well below the ECB's target of just under 2%, possibly giving the bank room to ease monetary policy further to help boost the eurozone's weak economy. I would like to add that when the money printing leads to the inevitable bond market and currency crisis this still in my opinion not lead to deflation. Rather we will have a loss of confidence, a flight to hard assets and a rise in interest rates that will push up the cost structure. I admit in all humility to not being a millionare but I have done quite well by doing the opposite of what the deflationists advise, although to be fair to Mr Shedlock he has always been bullish on gold. Yes the argument has become circular, ignoring the facts won't make them go away. and if you haven't noticed the bond market bubble has burst. Even the Fed keeps reducing its forecast, and this was before the latest U.S. budget disaster which will reduce growth even more than already anticipated. U.K. house prices notwithstanding, you cannot have inflation, at least not in the world's largest economy, in an atmosphere of doom and gloom. All we need now is another massive 20 % - 30 % stock market correction to sound the inflation death knell, at least for the next 5 years. Not just UK but US house prices - 30% gain by early 2016 (as of Jan 2013 forecast). Okay, we disagree, that's fine. Just one closing thought that you have not considered - WHO BENEFITS FROM RISING INTEREST RATES! - Everyone with CASH, corporations, retirees, and savers. So all those corporations with cash mountains will be marked UP.